The Dynamics NAV Support team have been asked many times about how to configure NAV client timeout values so we have written this post as a simple overview for this topic. There are some other advanced settings involved in this mechanism which you can read about here. 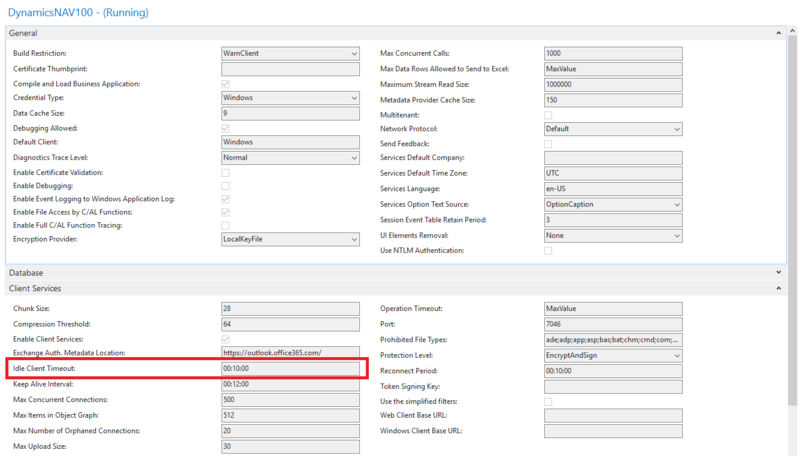 However, to configure the client timeout interval it is sufficient to set the Idle Client Timeout setting as described above. With cumulative update 8 for Dynamics NAV 2016, released in June 2016, a new server configuration option called „Keep Alive Interval“ was introduced. This setting allows you to configure the time interval between „pulse signals“ automatically sent by all client sessions to the NAV Service in order to prevent the client session from going into an idle state. For example, in the screenshot above you can see that the „Keep Alive Interval“ (immediately below the red box) has been set to 12 minutes. Note that because this value is higher than the „Idle Client Timeout“ setting it will ensure that truly idle client sessions will actually time out after 10 minutes. If the above „Keep Alive Interval“ above were reduced to less than 10 minutes (e.g. „00:08:00“) then no NAV client session would ever timeout because they would have been configured to send a keep alive pulse to the server every 8 minutes so would never qualify for the 10 minutes „Idle Client Timeout“ as configured above. We hope this clarifies the process for setting the timeout for the Dynamics NAV Windows client and Dynamics NAV Web client.